As usual I am behind the rest of the world, only becoming aware of the Band Aid 30 single 'Do They Know It's Christmas?' last night, and the subsequent backlash today. I'll admit I used to have an issue with celebs making a big deal of raising for charity, but these days it is expected of them. However, I never really thought of Do They Know It's Christmas? in that way, simply because the original is one of my favourite Christmas songs. When I listen to it, I'm not looking down upon those in famine, natural disaster, sickness, etc, I'm just being reminded that there are so many people who are struggling. As a listener, I don't worry about which Country (or Continent) the song is directed at, or why those Countries can't solve their own problems (after all, people are dying of starvation in the UK, so we're certainly can't judge). I don't care how 'patronizing' the lyrics are (personally, I've never thought of them as such), nor who is singing what. All this controversy is just political correctness gone mad, unfortunately a term I use a lot. And it is a shame we are more interested in pointing fingers and blame, than appreciating that the money is being raised. Because, at the end of the day, all that matters is that the money is being raised, and progress is being made. Who cares why, or how, as long as something is being done. And Band Aid 30 has made me more aware of the ebola virus, so I'm struggling to see how that is a bad thing. So watch the video. If you like the song download (buy) the song or put it as your ringtone. Donate if you want to. And ignore the judgement and just enjoy it for what it is. When I moved into my flat one thing I didn’t like was I could barely hear when it rained unless it was absolutely chucking it down. Today I realised I haven’t been sitting in the right place or allow enough silence to truly let the rain be heard. In modern society there is no such thing as silence. We are constantly being bombarded by music, strange noises from our phones, having the TV on ‘in the background’ – and that is just inside the house. The only time I am really quiet is when I’m reading, and honestly I that isn’t completely silence as my mind is being filled with someone else’s words and thoughts. And that moment between putting down the book and deciding what to do next, that moment that is only filled with silence, is not something I look forward to. I find silence disconcerting. I don’t know how to feel or what to do when it’s too quiet, so I fill up my days with as much noise as I can find. It’s not exactly intentional, but it’s become something necessary to feel calm and safe. Because silence isn’t safe. Silence forces us to listen to our own thoughts without any outside input; it forces us to truly take stock of how we’re feeling. And, unfortunately, because we are so busy filling our lives with noise, we don’t always notice how run down we are, and we don’t want to know. So we fill our lives with noise. There isn’t really a point to this post, it’s simply an observation. I thought about making it a point that I’ll try and have my silence in my life (because I will), but honestly I don’t know whether noise isn’t just as important. Do you make intentional time for silence? Have you found it to be helpful, or does it not really make a difference? Today is remembrance Sunday, and as a Scout leader I joined the local parade and service. I used to participate in this every year when I was a teenager as part of the army cadets, but this is the first year I had a remote understanding what it is we are remembering. As it is 100 years since the outbreak of WWI, there has been a lot of documentaries and dramas on the BBC this year. Through these I have learned so much, often more than I could deal with emotionally. Yet I am still aware that I have no real comprehension of life during the world wars, let alone life in the trenches. What I do know is war is just as terrible if you are fighting on the other side. Today the Padre said something that horrified me. He said ‘we should take pride that those young men died (during the world wars) fighting a wicked and evil enemy’. I can understand family members feeling pride that their son fought for justice and peace. I can understand that those who created the wars were/are wicked and evil (at least in our point of view). But I also know that those men didn’t die fighting those who had started the war; they died fighting men exactly like themselves. Those men believed they were fighting for peace and justice, just as much as our men did. War makes everyone the same, and to imply it is heroic in any sense, is to avoid the issue of the fact they are fighting for their beliefs as those on the other side are fighting for theirs. When we remember those that gave their todays so we could live in this tomorrow, we shouldn’t only remember those from our own countries, but those from every country. 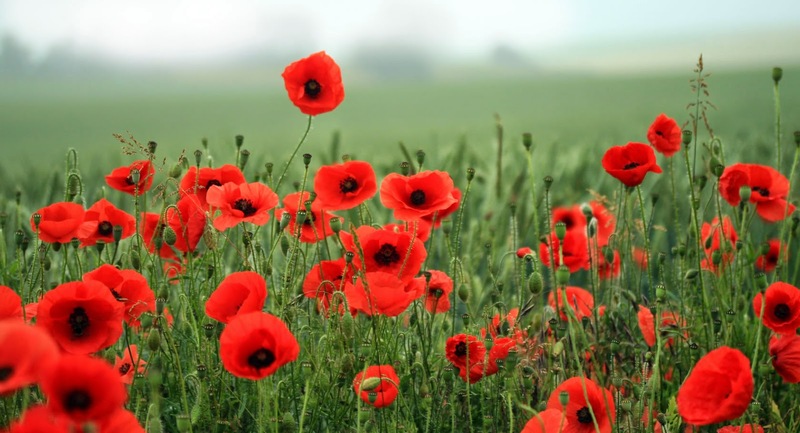 We remember so their lives weren’t given in vain, that’s what we like to tell ourselves. Yet, to me, it seems as if we haven’t learnt anything from the horrendousness and tragedy of the world wars. People are still fighting. They say it is to maintain peace, but all I can see is death and pain and sorrow. Halloween has always been a time associated with 'egging'. I don't mean egging in the sense of 'egging on', but rather egging someone's house. While I've known about the idea since I can remember, I've never had it happen to me, or even heard of it really happening. I suppose technically I didn't get egged, but the bus I happened to be in, was. And, in a way, that is so much worse (although, admittedly, I did feel thankful I wasn't the one who would have to clean it up). Services like buses are there for the general public. I am a big believer in public services, whether than be buses, trains, NHS, libraries, government websites, etc. But I'm beginning to wonder if I'm alone in the belief that these services not only help those in need, but are necessary for a stable community. I'm not going to go into the politics, as that's for people with a much better understanding of it, but I am a person who relies on many public services. Whatever you may think, those services were created for a reason, and it is people like those egging the bus (and the politicians, but again, not going there), that are causing them to wither and die. I have a feeling it was likely teenagers with nothing else to do, not surprising when you realise that almost all young people's services have already been cut. I have to be honest, I don't know how we can ever remedy the society we are currently living in. But I believe that every person has the ability to change the world around them for better or worse by thinking before we act (and sometimes acting when we normally just think) . It might not necessarily be in a big way, but I for one hope my contribution will be positive, even if it only effects one other person. Lately my days, weeks, and months are melding together. Multiple times a day I have to double-check what day it is, as it never feels like the day it actually is any more. And now that Scouts have finished for Summer, there is nothing to remind me when it's the weekend. Of course, most of my days are the same - resting, reading, writing, resting, sleeping, watching TV shows or films, resting, creating, etc - so it's not a big deal, but I still find it irritating to not even be able to remember what day of the week it is. The last time time slid like this for me, was the end of my first year at University, one of the happiest times of my life (I was able to sleep and go out when I felt like it, and had just started dating Chris). Right now there are many reasons why I'm not as happy now as I was then, but I've found this melding of time means it's a lot easier to accept life and my limitations. I know it's not a sustainable way of living, but for now I'm letting time glide by me as it's both relaxing and rejuvenating me, and has made space for hope to creep back into my life. Today I went to my local grocery stores (using my electric scooter as always). It doesn't sound a lot, but to me it was more like a miracle. On Friday evening I went to the Scouts meeting as I usually manage every other week. On Saturday I spent 10 hours at a local event which Scouts was a part of. I don't even remember the last time I got up at 7 am. While there I mostly sat in the tent showing kids how to decorate biscuits. Though, to be honest, not many seemed that interested as there were bouncy castles right next to us. If I had attempted such a long day a few months ago I would have been bedbound for at least a few days at the very least. And that's what I expected this time - I felt it would be well worth it to be a part of a Scout activity that wasn't just the regular meeting. I am in a lot more pain and more exhausted than usual, but I am still functioning enough to make myself lunch without an issue and still managed to go out today. I am planning on spending most of this week resting, but I have to admit I'm in a bit of shock at how little my weekend seems to have affected me (of course, I could be saying this prematurely as response symptoms don't always arrive straight away, though for me it is usually 2 days later which would be today). I know I have been saying to people that I am slowly improving. It's something I am constantly telling myself as well, I think as I still can't fully believe it. That's why it's so important to document when something like this happens, to show me as much as you that it's true and I really am improving. Still a very long way to go before I can live any semblance of 'normal' life but I am stepping forward and that's enough for now. Sorry for posting this so late (it is 10 pm here after all), but Valentine's Day sort of crept up on me this year - I was aware of it, I just didn't make the connection in my mind until I was just inundated with Valentine videos on my YouTube stream. I'm sure you don't care about that, so I'm just going to tell you about my favourite Valentine memory. I was in Sixth Form (wow, that was at least 8 years ago) and dating a boy called James. In our group of friends, there was only one other couple, so we made the choice to go on a double date. It could have been a disaster, but it turned into one of my best memories of all time. We chose Great Yarmouth as our destination (I still have no idea why we thought that was remotely romantic) which meant getting on a train. I remember being quite excited by this fact alone, as it was the first time I went on a train without my parents; it certainly added to the 'grown-upness' of the whole day and I know that it felt like I was finally an adult (who had responsibilities as well as freedom). The first thing I actually remember is when we met up at the train station. When asked, I specifically told James that I didn't want anything expensive or any soft toys. He turned up with the Valentine bear from Build-a-Bear (definitely expensive, and definitely a stuffed toy); I was really pissed at him, after all, I now had to carry around this great big cardboard box all day. Yet I decided to let it go (I think that was a first for me) as I wanted to enjoy the day. To be honest I don't remember much else. I know it was a Sunday so almost everywhere was closed, there were very few people around, and the weather was grey and wet. We went into an arcade where they had ten-pin bowling - the really old kind with strings on the pins and every bounce of the ball made you think the floor was going to give way (it was on the second floor). Before that day I didn't even realise there was bowling without screens and automated systems. We had pot noodles from a machine for lunch, as we couldn't find chips anywhere. Then of course had to have ice cream as we walked along the beach in the rain. These are the few specifics I can pinpoint in my mind. What I really remember about the day was how happy I was. I was spending the day with my boyfriend and two of my best friends (admittedly, I didn't know the guy that much back then, but not the point). We never ran out of conversation and there was a lot of laughter and the kind of gaiety that has you running in circles on the sand with your arms widespread. I know there are many times since then that I've felt just as happy (or even happier), but that Valentine's Day was the first time in my 'adult' life when I fully embraced that joy and knew that if I had that feeling every now and then, life wouldn't be too bad. Since then I've been lucky enough to have that feeling often and always do my best to embrace it. I have a feeling that in ten or twenty years time, I will still remember that Valentine's Day. Even if I forget what actually happened, I am sure I will always remember where my ability to embrace life's joys started. One thing that is often recommended for those of us living with chronic disabilities such as M.E. is to keep an 'energy diary'. Basically this means staying aware of how much we are resting, and how much low/medium/high activity we are doing. Of course, this varies from person to person, as everyone's energy level is different - for example, taking a shower is a high-level activity for me now, but I know that for many people showering isn't something they would classify as difficult. Anyway, I was advised to do an energy diary when I was first diagnosed; and I did, for a couple of weeks. Honestly though, I found it annoying having to remember to write things down and highlight the colour etc. Recently I became aware that as my health has changed so much, I should start keeping an energy diary again. I resisted starting one, as it's not a 'fun' thing to do, and if done on paper, it does cut into my available energy. So I Googled to see if there were any apps I could use to keep track of what I'm doing, and was amazed to discover one that is actually designed for people in the same situation as myself. M.E./C.F.S. Diary Pro is an app where writing down what kind of activity I'm doing is as easy as pressing a colour-code button and then tapping the half hour block it correlates to. Not only can you then easily see how much of each thing you've been doing (for example, I can see I need to rest more often), you can add in how bad your symptoms are and access graphs showing the data over time. Of course, I wish the app was a little more adjustable to the individual case, but it is still definitely worth the £4.99 (though it's on offer this month as the new, updated version has only just been released). I am certain I will be using this app for quite a while, and it's much easier than having to map out what I'm doing via pen and paper, as it requires very little effort for me to just press a few buttons instead. Do you keep an energy diary? Have you found it useful? I would also love to know if there are any other apps other spoonies have found useful. Labels: Sunday Shout Out, Thoughts on Living With M.E./C.F.S. For those of you who aren't Doctor Who fans - this post isn't really about Doctor Who, though the video above prompted this post and is a good example of my points. As I was watching all the different Doctor Who opening credits, in order, I couldn't help but notice that as I viewed them in my head I was thinking 'yes, that's definitely 70's, and that is obviously 80's, and OMG that is sooooo 90's'. Of course they are all similar and you can see how the theme evolves into what it currently is, and that in itself is probably a whole other post - seeing how over time one thing can morph into something completely different yet when you break it down it is easy to follow the progress, and wondering if Doctor Who will still be around in 20 years time. But my point, seeing as there is one I am actually trying to get to, is that there are certain things we automatically associate with certain time periods, and these are especially noticeable in television as different effects were discovered and became popular. From those associations, we create ideas of what those decades were like - eg. swinging sixties where everyone was a hippy with long hair; eighties with flared trousers and neon clothes. Obviously I can't know what those years were like, only what is projected from films and photos and stories. And this got me wondering (yes, I'm almost at what I wanted to write about), is what people in 40 years time or so, will look back and think of us right now. What things will they remember, what will be distinctive about our society and culture? This is something I often think about, and of course cannot have any clue, but I think it's something that's fascinating - that we are living history right now. I can't wait to find out what the future holds, but I also would love to know what future generations will look back and see. I guess this post wasn't particularly cohesive and a bit rambley, so sorry about that. However, I'm super excited about the fact that once again I seem to have started having ideas I want to write about that aren't simply updates about my health, so fingers crossed there will be more random content spewing from my brain here soon.